Choice Unlimited is a roadshow event that showcases information, services and products for older people, families with disabled children and carers. As a trusted specialist in accessible bathing, Abacus Healthcare will be demonstrating one of its popular power-adjustable baths to visitors attending the Choice Unlimited event in Leicester. 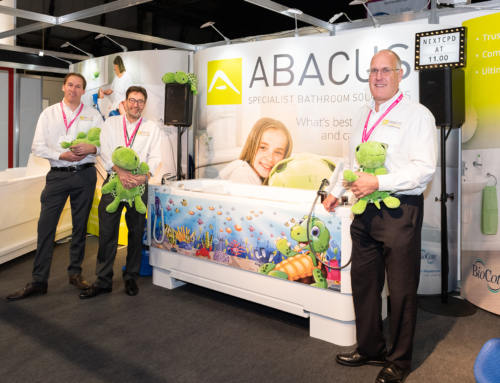 Bob Gibbs, Abacus Product Specialist, will be available at Choice Unlimited to discuss individual assisted bathing solutions for families with disabled children, elderly relatives and their carers. An Aquanova Gemini will be available for demonstrations on the Abacus stand as it provides the ideal accessible bath for domestic bathrooms. It is compact, height adjustable and includes a 3-in-1 changing, drying and bathing platform that makes bath-time more pleasurable. Bathers with limited movement can sit on the raised platform before being lowered into temperature-controlled water in a smooth and safe manner. Both the height adjustment of the bath and the platform also ensure carers can avoid potential back and muscle strain which is commonplace when manually lifting bathers.